In 2015, Catherine established The Institute for Collaboration and Play (www.IFCAP.org). She facilitates the ﻿PLABORATORY﻿ (A Laboratory for Play). The PLABORATORY is a playground for performers, directors, theatermakers, artists -- anyone interesting in infusing his/her artistic practice with the insights that come from working performatively from a place of play and collaboration. PLABORATORY POP-UPs are a way for anyone to experience the PLABORATORY. All are welcome. Please visit www.IFCAP.org for more details on the PLABORATORY and other IFCAP offerings. This two-day intensive facilitates a personal and communal investigation into your individual creativity. Who are you as an artist? What is your artistic lineage? What kind of impact do you want to make in art + the world? What values drive your making? What practices activate your making? making. Please bring a project in development as an additional point of reference that will be explored via this laboratory. Course structure includes two full Saturdays + one mid-week individual meeting with the instructor. Anticipate assignments throughout the course. Appropriate for artists seasoned in their work and at the beginning of a new stage of working. Come prepared to vibrantly discover, dismantle and rediscover your artistry. To register or ask questions, please email Dana at DanaAtIFCAP@gmail.com or visit www.IFCAP.org. CLOWN. Be amazing and be amazed. This work will vigorously thrust you into an investigation of your role inside the comic world. Set aside your socialized self for one of epic dynamism. Have more fun, connect joyfully with an audience, and cultivate curiosity and vulnerability. Be vibrant in pursuit of your playful essence, the start of your art. 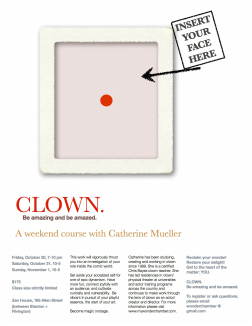 Catherine has been studying, creating and working in clown since 1999. She is a certified Chris Bayes clown teacher. She has led residencies in clown/physical theater at universities and actor training programs across the country and continues to make work through the lens of clown as an actor/creator and director. Reclaim your wonder! Restore your delight! Get to the heart of the matter: YOU. Be amazing and be amazed. Take the reigns of your artistic progression. Make the work you yearn to see and be a part of. Propel your creative process and investigate your artistry in action! Make/Show is a new 8-week course designed to give the generative theater artist the space, tools, critical development and support to create a piece of physical theater - your piece of physical theater. Designed in response to a growing trend of theater artists taking control of their creative output and specifically geared towards visually arresting, non-traditional performance styles, this course is led by Catherine Mueller of The Orchard Project. It is a hands-on, provocative and playful voyage beginning with a work-in-development or nascent project of the artist's choosing which is nurtured and worked upon in and out of class towards a small public showing at the end. This course will provide a time-frame, impetus, ideas, feedback, provocation, deadline and audience! Artists must apply with a strongly formed sense of their piece - this can be in the form of a script, a research scrap-book, part of a show already made or a well articulated sense of the world, theme and style of the piece they have in mind. Participants must also demonstrate a commitment to a concentrated period of rehearsal on their piece outside of class. Throughout this course you will meet other like-minded artists, receive feedback from prominent NY creators of physical theater and be given 12 hours of free rehearsal space. *more than one artist per project can apply. For more information, please visit www.movementtheaterstudio.com. Engage in a highly individualized and specialized artistic process, designed to stimulate, provoke and enhance your current artistic yearnings. First, an outline is created to articulate a set of goals for your personal creative project. Then, in a series of sessions, the length and duration of which as best suits your project and budget, Catherine serves as provocateur, point person, director, dramaturg and audience, guiding you through a phase of development that both deepens and expands your process of artistic research, your performance aesthetic and purpose and project content.